A peanut butter blondie in muffin form that gives you sweet and salty all in one bite also you get the crispy part of a brownie all around. I was inspired to make these blondies by a famous chocolate bar that's a caramelized 'gold bar' that has peanuts and pretzels. It has an explosion of flavor when you bite into because of the sweet and saltiness.Which happens to be my favorite flavor combinations. These are a peanut butter blondie with honey roasted peanuts, salty pretzels and a touch of white chocolate in a jumbo size to share or eat all by yourself, I won't tell anyone, an explosion of sweet and salty flavors. If you are having a bad day or week make these, you can smash things like the peanuts and pretzels plus you get a reward afterwards. 1. In a medium sauce pan, melt butter then add brown sugar. Bring to a low boil for 2 to 3 minutes. Remove from heat and add vanilla extract. Whisk then add peanut butter a half a cup at a time. Whisk until melted into the butter. Let cool for 10 minutes. 2. Preheat oven to 350 degrees and grease muffin tins with nonstick spray. 3. Whisk together flour, baking powder, baking soda and sea salt. Smash peanuts and pretzels lightly, just until small pieces. 4. Fold in peanut butter mixture into the flour mixture until just incorporated. Add eggs one at a time until each egg is incorporated. Fold peanuts, pretzels and white chocolate into the batter. 5. Scoop out dough into muffin tins 3/4 way full. Bake for 20 to 25 minutes until golden brown and a toothpick comes clean. 6. Let cool in pan for 10 minutes on wired rack then tip over to the wired rack and let cool completely. Store in a cool place. Looks really yummy! All I would have to do is find the substitute for eggs and milk to make this vegan. I love sweet and salty dishes. Like I live for them! You can always use soy or almondmilk. These sound delicious,! I love peanut butter and the sweet and salty combination so this will be a must try. Peanut butter, pretzels, a blondie and a muffin too!? Sounds good to me! They look fantastic! Oh my goodness, these look absolutely delightful. I had previously thought that adding pretzels to muffins was weird but I recently had a pretzel in a cookie and it was amazing. This is a recipe I can't wait to try. Yum! Love this combo of flavors! Yum! I love a sweet and salty combo. Bring them in muffin tins is such a smart idea. These look like a great breakfast or snack! Ok! I need these right now! So. Much. Yum!! I always prefer blondies over brownies because I am not overly fond of chocolate, but I have never heard (or thought) of putting pretzels in them, but I love me some salty sweet. These look so good!!! I love all of the ingredients and can’t wait to try out the pairing. Thanks for posting this treat!!! I’ve been loving anything sweet and salty lately! I can’t wait to try this! These look absolutely delicious! What really cought my attention was that they are peanut butter. I have a huge peanut butter obsession. I actually use to melt peanut butter to pour on my banana nut mufins. I've even dipped pretzels in it. This seems like the equivalent of all 3 in one yummy snack. I'm definitely going to try it! This definitely meets the sweet and salty. I can only imagine taking a crunchy bite reaching the soft inside and hitting a nice salty peanut. This is definitely a fun sounding muffin. My weaknesses! Peanut butter, muffins, even white chocolate is here. I'll be having these tomorrow, thanks!! These look so amazing!! I don't think I have ever had a blondie that incorporated peanut butter! Plus, I love the idea of the textural element! Ouu these looks so delicious! 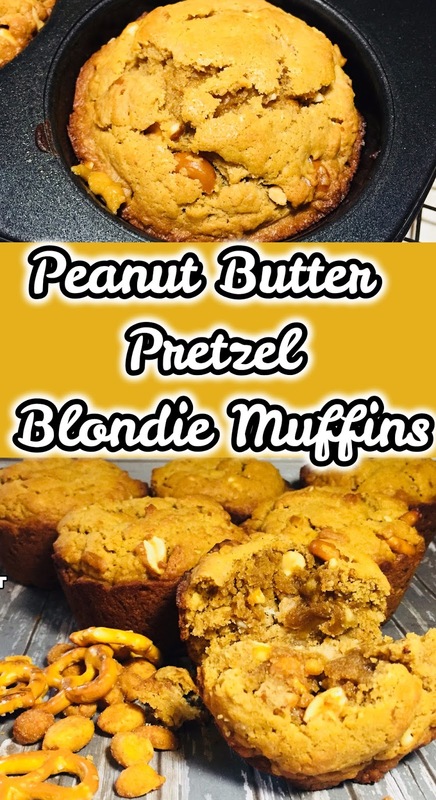 I never thought to add pretzels to my muffins, but this is a brilliant idea! These look delicious, I never thought to put peanut butter in a muffin, I will have to give it a go! I love a good peanut butter muffin, and these had my mouth watering just reading the description. Adding pretzels and nuts sounds amazing. YUM! I love the idea of making these when I'm having a bad day so I can smash stuff and then get a sweet and salty reward. Thanks for sharing these, they will be happening in my kitchen! Yum! I love the sweet and salty combo. If I made these I think I'd use milk chocolate instead of white because I am a chocolate fiend! I've never thought about putting pretzels in a muffin! I LOVE pretzels and peanut butter, my son would enjoy these! What a delicious combination. These must be delightfully good. Yum! These looks good and a must try recipe. All your recipes always look so good! love the pretzels in there! Omg. These look so good! Sweet and salty is one of my favorite combos. and peanut butter is always a win. These muffins look delicious! With a few modifications, we'll totally bake them for friends. These look absolutely delicious, and I gotta say, I love the design of your blog! Sweet and salty are my two favorite flavors, especially when you combine these two. The muffins really look great plus peanut (another fave) just a delightful dessert for me. These look absolutely delicious. I am free this weekend and must give them a try. The recipe looks quite easy too! I love pretzels and I love blondies. But I've never had them together. Definitely have to give this a try. After reading this I"m thinking about trying this recipe. Thanks for sharing. I love sweet and salty too! What a fun combination. I've done this with cookies before, but never thought to do muffins. Yummy! I love making homemade muffins. And peanut butter? You just can't go wrong. These look AMAZING! I must try. These muffins look very tasty! Thanks for sharing a very detailed recipe on how to bake it. I'll definitely try this! I am not that much of a baker but would love to taste these. Are these bite sized? Peanut butter is my fav fav and these are gorgeous and makes you want to gorge on them hehe! ooh this looks yummy! I want to try it! First of all, how have I never seen brownies in muffin form before! Brilliant way to get that yummy crunchy part! And I love the addition of pretzel! This is a fun recipe, I have never thought to mix pretzel into muffin, hubby love pretzel, he will devour this muffin!